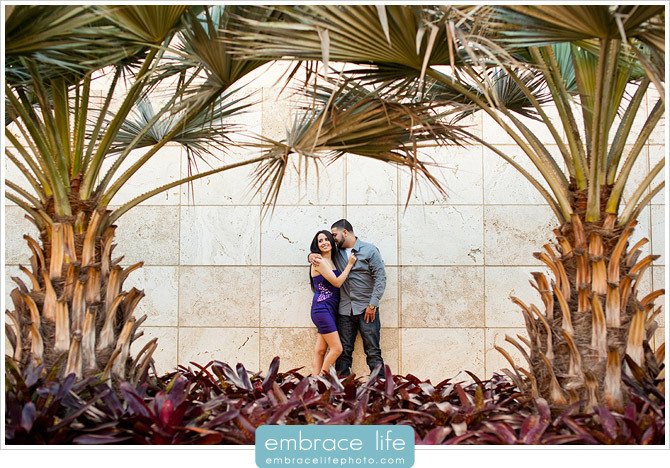 One day I received a phone call from a Texas phone number; it was someone named Enrique asking me if I could photograph his surprise proposal to his then girlfriend, Fatima. Enrique was so polite I doubted this was a real call. Soon enough, though, we were planning the details for this exciting afternoon. Enrique told me that over the seven years that he and Fatima had been together, she had asked him many times to commission a professional portrait of the two of them. So, for their anniversary, he was finally going to surprise her with a shoot. And that wouldn’t be the only surprise; at the end of the shoot, Enrique would propose to Fatima. 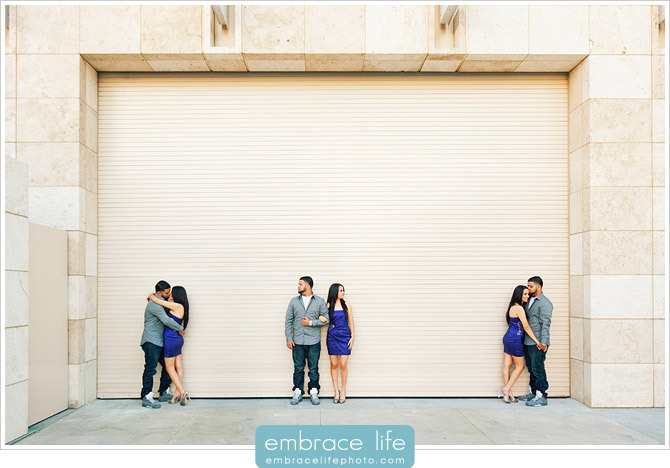 What a brilliant way to get the proposal photographed up-close and personal, right? But, how would he get her to Los Angeles for the shoot? 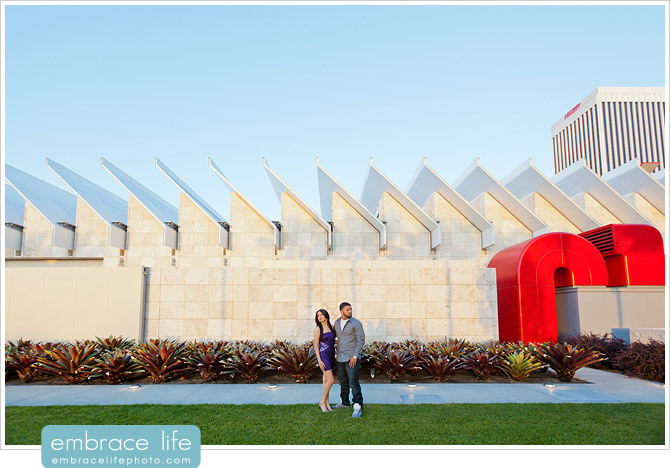 Enrique told Fatima that he needed to go to Los Angeles for a business meeting and that he’d like her to come along. This was also a genius way to have her pack lots of nice clothing, perfect for a professional photo shoot (that she didn’t know was going to happen). The day of our shoot, I waited in the lobby of The Beverly Hills Hotel for Enrique and Fatima to arrive from their flight at LAX. As they came through the door of the hotel, Enrique and I exchanged a knowing glance before he and Fatima went to the counter to check in. After check-in, I walked up and introduced myself to Enrique and a very confused Fatima. I explained that for their anniversary, Enrique commissioned me to create some beautiful portraits of the two of them as a gift to her. They hurried to their room to change and prep for the shoot. I can only imagine that this was not an easy thing for Fatima to have land in her lap the second she arrived from her flight, but she was ready to go in no time, looking great and enthusiastic. For the actual moment of the proposal, I switched my camera to HD video mode to capture the entire sequence. Above is a still frame of that very moment. Be sure to watch the slideshow with the entire proposal video sequence at the bottom of this post, too. 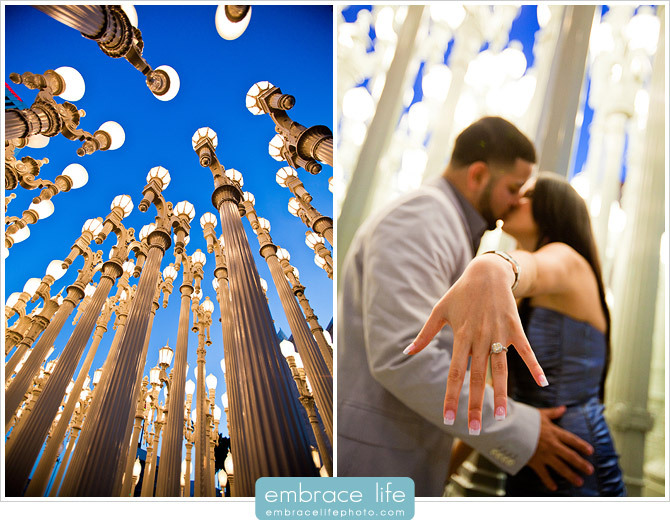 In advance, Enrique and I had planned that once the sun went down, we’d head over to the beautiful street lamp installation at LACMA where he’d propose to Fatima when I said, “Enrique, for this one, I want how much you love Fatima to really show”. At this point, he was supposed to kneel down, pull the ring out of his pocket and propose. There was a small problem, though. When I finally said that, Enrique didn’t have the ring in his pocket! Oops! However, quick on his feet, Enrique responded, “Oh, I have a card for you in my bag, Fatima. Let me get that.”. He slyly grabbed the ring, returned and proposed. Fatima’s reaction was priceless! Enrique, you’re the man! Great job. Congratulations Fatima and Enrique! We wish you two all the best. Brought tears to my eyes!! 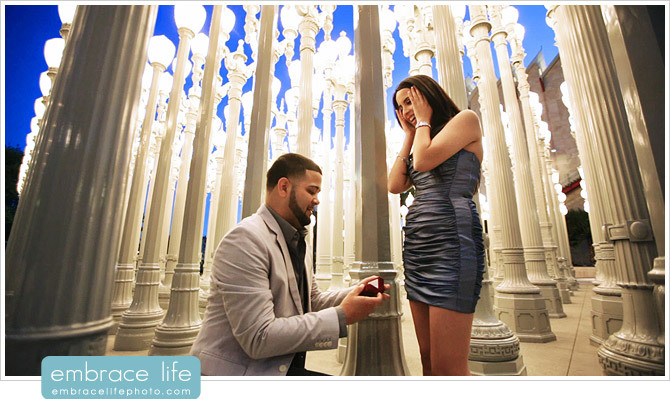 What a thoughtful and beautiful proposal! And needless to say, Adam and Embrace Life are able to capture each moment absolutely perfectly. Congrats to the couple and BRAVO to Adam and Embrace Life! 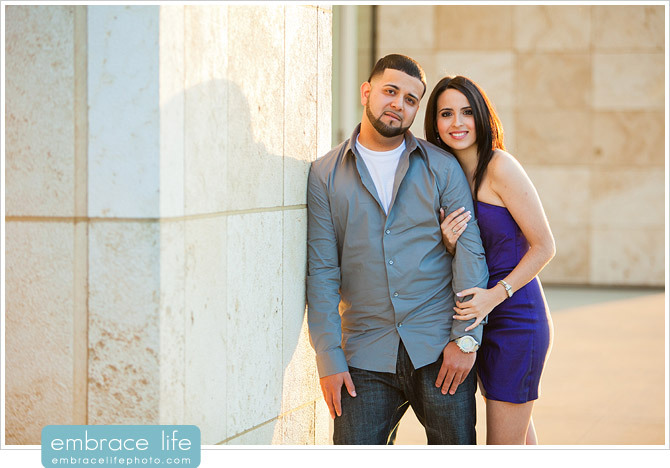 Adam, it was such a pleasure working with you, you made us feel super comfortable & the outcome of the pictures are impeccable! I am literally in tears as I read the blog. Happy tears of course… you just made me relive those moments & I thank you for that! We can’t wait to go back to LA & have another shoot with you. I truly believe it was fate that Enrique contacted you & the way it al played out. I wouldn’t change a thing & I will always have this story, the pictures, & video to reminisce & one day share with our kids WHOLEHEARTEDLY THANK YOU!!!! !